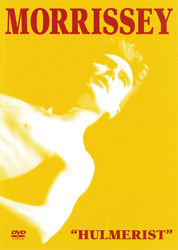 DVD DVD back UK video front UK video back UK Music Club video UK Music Club video back Japan laserdisc Japan laserdisc back USA laserdisc USA laserdisc back DVD set with "The Malady Linger On"
Compilation of Morrissey's first six videos interspersed with footage of fans waiting in line to be let in to the first Morrissey solo concert, in Wolverhampton in December 1988. The compilation also includes the live performance of "Sister I'm A Poet" from that concert, which hadn't previously been used for promotional purposes. The tracks on this compilation (bar "Ouija Board Ouija Board" and the live "Sister I'm A Poet") were re-released on the "¡Oye Esteban!" DVD in 2000 along with most material from the "The Malady Lingers On" compilation (which covered 1991-1992) and later uncompiled videos from 1994 and 1995. "¡Oye Esteban!" was aimed at the North American market and never released on DVD elsewhere. 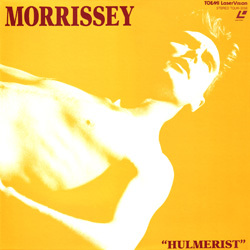 "Hulmerist" and "The Malady Lingers On" were instead released on DVD in 2004 for the UK and Europe markets. 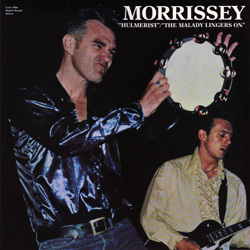 * USA laserdisc also includes the songs from "The Malady Lingers On", Morrissey's second video compilation covering 1991 and 1991. 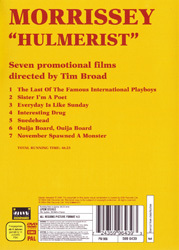 ** After being re-released on DVD separately in May 2004, "Hulmerist" and the second video compilation "The Malady Lingers On" were repackaged and sold together as a set on 1 November 2004. Morrissey, photographed by Barry Plummer. 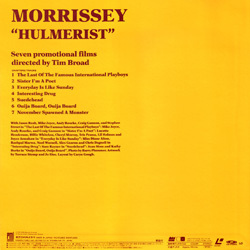 UK: Time-coded viewing copies on VHS format were distributed for promotion of this compilation at the time of its initial release. When it was made available on DVD format in 2004, test discs with handwritten labels were used for promotional and also perhaps in-house purposes. Germany: Something from this video compilation was included on a various artists EMI Germany sampler video titled "EMI Germany Presents Music On Video". The exact content is not known, but it is expected to be a montage of highlights instead of a complete song/video. USA: A promo version of the USA video (#38175) was distributed to retail and/or media in a black card slipcase. Some copies of this item may have a white promo sticker dated 06/07/90 on them. The video for the live version of "Sister I'm A Poet" (the only new video on this anthology) was included on a various artists Warner Bros video sampler simply numbered #182. There may also be a different various artists compilation, this one titled "Music Video Compilation Reel" (or both could be one and the same). The "Sister I'm A Poet" video was also included on the December 1990 issue of the Rockamerica various artists promo videos series.